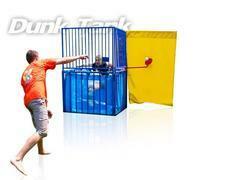 Dunk Tank Rentals are great for any backyard party, or large event. Nail the bullseye and soak your friends, Pastor, teachers or boss in our dunk tank. NOTE: We will need a hose to fill the tank and please allow 30-45 minutes to fill the tank. This is a great way to raise money for fundraisers as well as our Concessions or Bounce Houses.